A number of iMac Pro and MacBook Pro owners have reported issues with macOS enduring kernel panics, with initial investigations into the problems suggesting something connected to Apple's T2 security chip is to blame —but actual service numbers don't point to a hardware problem. Threads in Apple's support forums discuss issues with the iMac Pro, and more recently the 2018 MacBook Pro. All describe how the Mac crashes, entering a kernel panic and requiring it to be restarted, or in some cases rebooting itself automatically. 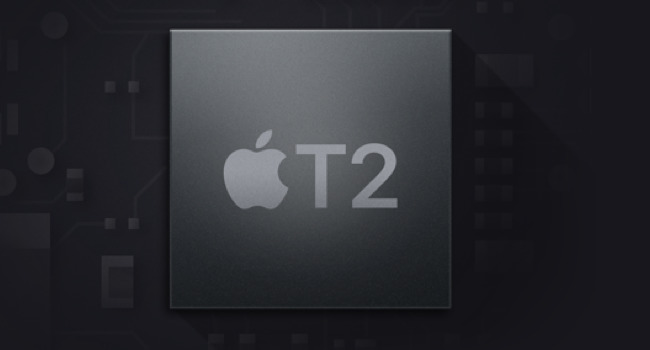 DigitalTrends noted the thread on Wednesday, attributing it to the T2 chip in the MacBook Pro. The publication believes that the problem manifested in the iMac Pro as well, and has been carried forward to the new hardware. A common trait found in the error messages is the mention of Bridge OS. The Bridge OS is an embedded operating system that is used by the T2 chip, which Apple uses to perform a variety of functions instead of making the processor handle the tasks. The T2 sub-processor manages the image quality of the FaceTime camera, as well as regulating boot safety and boot security, encrypting and decrypting data sent to flash storage, fan speeds, speakers, and secures built-in microphones. It is also used to power "Hey Siri" vocal prompts for Apple's digital assistant. While the cause of the kernel panics are unclear, with symptoms and hardware setups varying between users, Apple is seemingly aware of the problem and has been working on it since the start of 2018. One user notes the Kernel Version increase from 17.3.0 to 17.4.0 resulted in fewer panics, reducing the count from a daily occurrence to one that happens once or twice a week. In some cases, Apple has reportedly replaced the hardware, but the issue seemingly continued even on the new unit for a few users, suggesting a software conflict of some sort. In the posts, Apple support staff suggests iMac Pro users wipe and reinstall MacOS, disable FileVault, and disable Power Nap. For those not willing to perform those, other forum posts suggested crashes could be reduced by not daisy-chaining devices, not using a Thunderbolt 3-to-Thunderbolt 2 adapter, disable Secure Boot, turn off power management options, remove third-party kernel extensions, avoid leaving it to idle overnight, and to not unlock it with an Apple Watch. Using the same service centers that we've used for MacBook Pro keyboard failure rates, as well as for "bendgate" data collation from about two years ago, AppleInsider has collected data on possible T2 issues. Across all the centers we use since the iMac Pro release, there have been 103 iMac Pros coming in for some form of service under warranty out of a pool of well over 100,000 incidents across all of Apple's product lines in total. Of those 103, four of them were for unexplained system crashes linked to the "bridgeOS." Of those four, a fresh macOS reinstall fixed them all. This is obviously not a large sample of iMac Pro service incidents, from a computer that isn't selling in massive quantities. However, if there were a wide-spread hardware problem, it would be apparent that there was in even this small sample.